Here's one of Sam Loyd's puzzles with a little taste of mathematics. 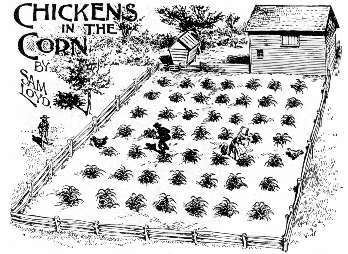 On a New Jersey farm, where some city folks were wont to summer, chicken-chasing became an everyday sport, and there were two pet chickens which could always be found in the garden ready to challenge any one to catch them. It reminded one of a game of tag, and suggested a curious puzzle which I am satisfied will worry some of our experts. The object is to prove in just how many moves the good farmer and his wife can catch the two chickens. The field is divided into sixty-four square patches, marked off by the corn hills. Let us suppose that they are playing a game, moving between the corn rows from one square to another, directly up and down or right and left. Play turn about. First let the man and woman each move one square, then let each of the chickens make a move. The play continues by turns until you find out in how many moves it is possible to drive the chickens into such positions that both of them are cornered and captured. A capture occurs when the farmer or his wife can pounce on a square occupied by a chicken. The game can be played on any checkerboard by using two checkers of one color to represent the farmer and his wife, and two checkers of another color to represent the hen and rooster. The applet below simulates the puzzle. To help grasp the essence of the puzzle, the applet gives an option to first try catching one chicken with just one member of the family: the farmer catching the rooster or the wife the hen. While writing the simulation I made an assumption, I believe implicit in Sam Loyd's formulation. Holding on to a live chicken not being a simple matter, a fellow who caught a chicken loses the ability to help out the mate in catching the other bird. To play, drag a farmer or his wife from one location to another, but only one location left, right, up, or down . When both are present, they both are to be moved before the chickens try to escape their pursuers. Besides the standard 8×8 board, the applet also allows to play the game on the 7×7 and 6×6 boards. The amusing point of this puzzle is that, play as you will, the "man" can never catch the "rooster" nor the "woman" the "hen," for, as they say in chess or checkers, the rooster "has got the move" on the man, and for the same reason the woman can never get the "opposition" on the hen. But if they reverse matters, the man going after the hen and the woman after the rooster, the chickens are captured easily! One chicken can be taken on the eighth move, the other on the ninth. A short experimentation with the puzzle is sufficient to convince one of validity of Sam Loyd's assertion. It's impossible for the farmer alone to catch the rooster and for the wife the hen. It does not make sense either for one of them to help another in catching one of the birds. For that feat would leave the good hearted one one-on-one against the remaining chicken. Because of the symmetry of the starting positions, if such a task can be accomplished, the first fellow would not need any help to start with. However surprising it may seem, the only possibility that remains is to make the farmer catch the hen and the wife the rooster. To me this is the gist of the puzzle and not counting the minimal number of moves needed. So how is this possible that the farmer can catch the hen but cannot catch the rooster? For the wife the situation is obviously reversed. where, as usual, the vertical bars denote the absolute value. dist1(PR, PF) = 2, dist1(PF, PH) = 5. The capture is only possible if the distance between the two opponents is 1 just before the human moves. A single move by either a chicken or a human changes the distance between them by 1. Unless it's captured, a move by a chicken restores the parity of the distance between it and the pursuing human. It thus follows that if the distance dist1(PR, PF) is even just before the farmer moves, his move can't prevent the rooster from moving. The distance between them will remain even before the farmer's next move. According to the observation #1, the farmer is incapable of catching the rooster. The initial distance dist1(PF, PH) between the farmer and the hen is odd. The farmer can always force the hen into one of the "corner" squares staying at the distance 2 from it (for example being on the diagonal square next to the corner.) The next hen's move will shorten the distance to 1 so that on the next move the farmer will be able to pounce on the hen capturing the bird. The same logic applies for the 6×6 board, but not for the 7×7 one. On the latter, the farmer is initially at even distances from both the hen and the rooster. Therefore, he can't catch either. The same is true of the wife. The conclusion is that for the given configuration in the 7×7 puzzle, farmer and wife have to cooperate to first catch one bird and then the other. It was my mistake to think otherwise. Due probably to a bug in the program, the impossible becomes possible. Herding one chicken towards the other may eventually prevent a chicken from making a move, thus, invalidating the parity argument.